A drop-top version of the Italdesign Zerouno coupe should appeal to those who think a Ferrari 488 Spider is just a little too common. 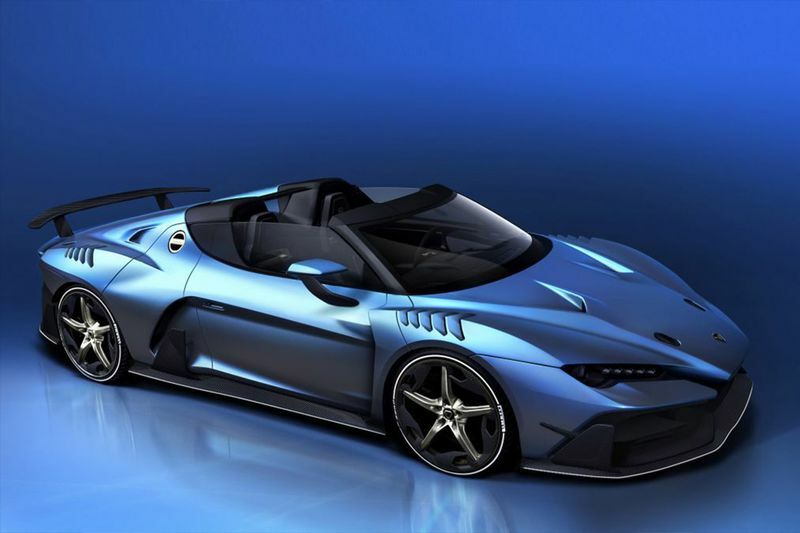 Italian design house turned coachbuilder, Italdesign Automobili Speciali, has unveiled a Duerta roadster version of the Zerouno for the Geneva motor show. The Zerouno is a low volume production supercar with extreme styling and a set of underpinnings borrowed from Lamborghini. Like its closed-roof sibling, the Zerouno Duerta is aimed at collectors rather than track day enthusiasts and thus will have a price tag to reflect that. Like the coupe, the Zerouno Duerta uses a 5.2-litre V10 engine and a seven-speed dual-clutch gearbox borrowed from the Lamborghini Huracán and Audi R8. Power will be sent to all four wheels and the car should hit 100km/h from a standstill in around 3 seconds. The aluminium and carbon fibre chassis are also from the Huracán, although the bodywork hung off it is new, with an aggressive aesthetic and loaded with aerodynamic aids including a stacked rear wing. Primarily a design exercise, the shape does hamper top speed compared with the more slide happy Lamborghini, although this is unlikely to matter for most owners. Italdesign is quoting a top speed in excess of 200mph. These figures have been achieved through a symbiotic relationship between the design and engineering departments, ensuring as little compromise as possible in its aerodynamic properties and dynamic ability. Looking distinctly related to Lamborghini’s latest design language, the supercar has been designed to offer what Italdesign calls 'two sides of one medal'. In other words, it combines smooth GT inspired design above the belt line and a more aggressive and technical look below it. Upon the launch of the coupe, Italdesign announced that it would start producing more ‘coach-built’ vehicles for ultra-wealthy clientele. As a subsidiary of the vast Volkswagen Group, Italdesign has all the tools to continue building these sorts of cars for collectors too, although we’re unlikely to ever see, let alone drive one in the wild. In what will become one of multiple ‘special cars’ under the Italdeisgn Automobili Speciali brand, the Italdesign Zerouno is part of the car industry's coach-built renaissance, a historic past-time that is being revitalised due to increased interest in bespoke vehicles from emerging markets, as well as the technical abilities of building in materials like carbon fibre. No prices for the Italdesign Zerouno have been announced but, given the exotic and exclusive nature of the car, expect it to be priced well into the millions.